Flounces, and ruffles, and frills — oh my! One of the season’s freshest trends brings a little something extra to the party, in the shape of added-on adornments of all varieties. Trends on trends! 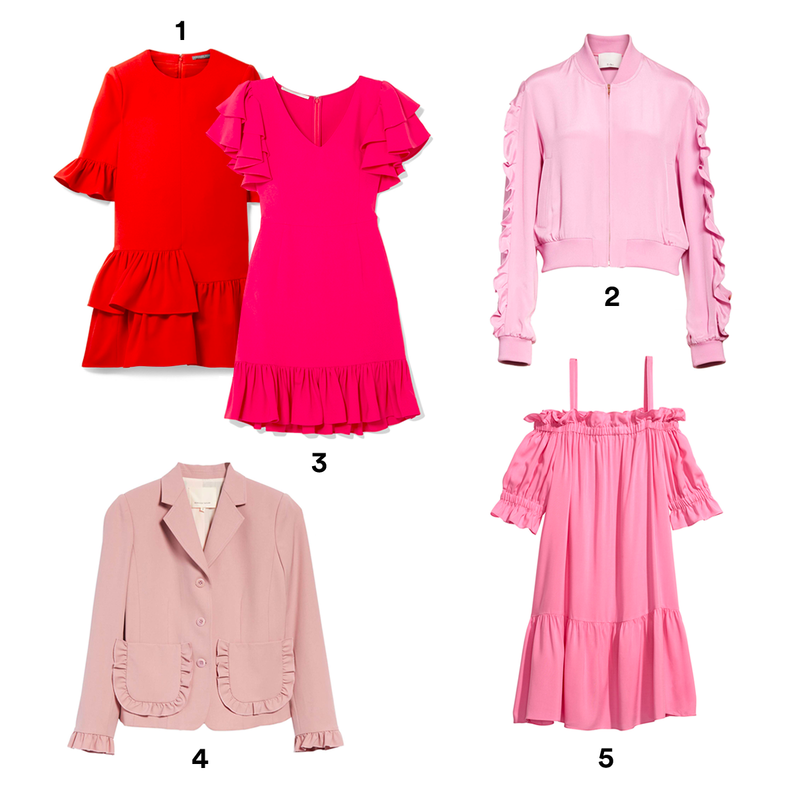 These styles not only rock a frill, but also make the most of one of spring’s most fashionable hues: pink. From blush to magenta, these pieces will have your look leading the pack. Product credits: 1) ALEXANDER MCQUEEN Ruffled Wool and Silk-Blend Mini Dress. 2) TIBI Ruffled Silk Bomber Jacket, available at Nordstrom. 3) STELLA MACCARTNEY Ruffled Crepe Mini Dress. 4) REBECCA TAYLOR Ruffle Trim Jacket. 5) H&M Open-shoulder Dress. There’s no time or place a well-placed flounce can’t fit in — even at the beach. Fun and flirty, these one-pieces will have you adding a little cha-cha to your splish-splash. Product credits: 1) ROBIN PICCONE Jennie Plunge One-Piece Swimsuit, available at Nordstrom. 2) BECCA Off the Shoulder Ruffle One-Piece Swimsuit, available at Nordstrom. 3) LISA MARIE FERNANDEZ Arden Ruffled One-shoulder Bonded Swimsuit, available at Barneys New York. 4) TOPSHOP Bardot Frill Swimsuit. 5) MONTCE Cynthia One-Piece Swimsuit, available at Nordstrom. Beyond color, there are certain fabrics that just scream spring, and all the more so when adorned with ruffles. 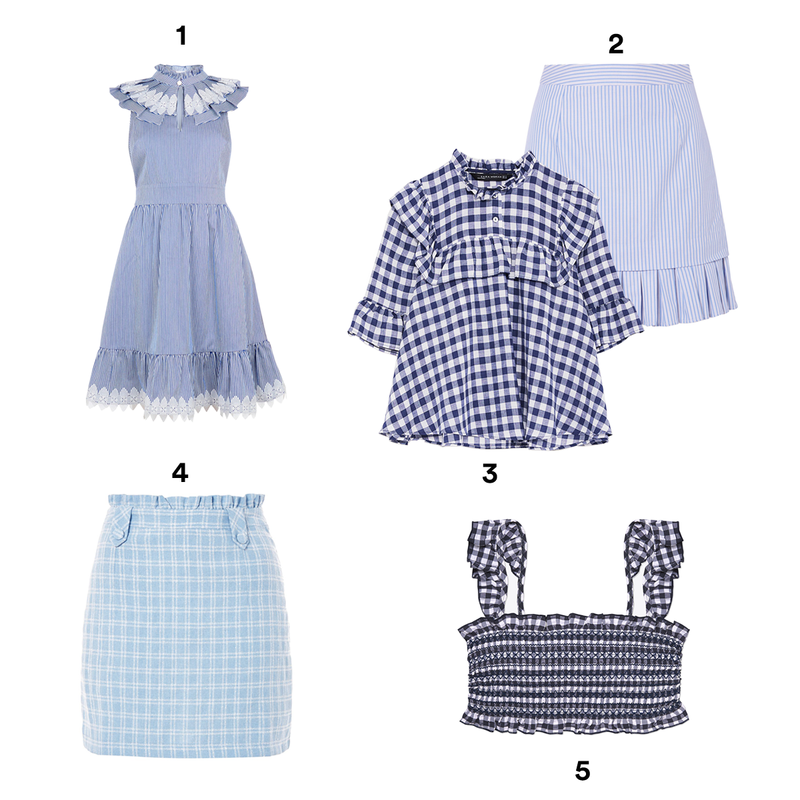 These gingham and seersucker pieces will have you picnic-ready in a flash. Product Credits: 1) TED BAKER Kikkii Frill Bib Lace Applique Cotton Dress. 2) MAGGIE MARILYN Lucy Pleated Striped Cotton Mini Skirt, available at Neiman Marcus. 3) ZARA Gingham Blouse. 4) TOPSHOP Check Boucle Frill Mini Skirt. 5) TORY BURCH Gingham Costa Ruffle Top. When embracing this trend, there’s no need to stop above the ankle. With sandals, pumps, and sneakers all getting the ruffle treatment, it’s never been easier to dip your toe into this trend and step out looking sharp. Product Credits: 1) TORY BURCH Tory Sport Ruffle Sneaker. 2) ISABEL MARANT Poween Silver High Heels, available at Saks Fifth Avenue. 3) 1.STATE Salyn Slide Sandal, available at Nordstrom. 4) ZARA Leather High Heel Court Shoes. 5) LOEFFLER RANDALL Rey Lamé Slide Sandals, available at Barneys New York. 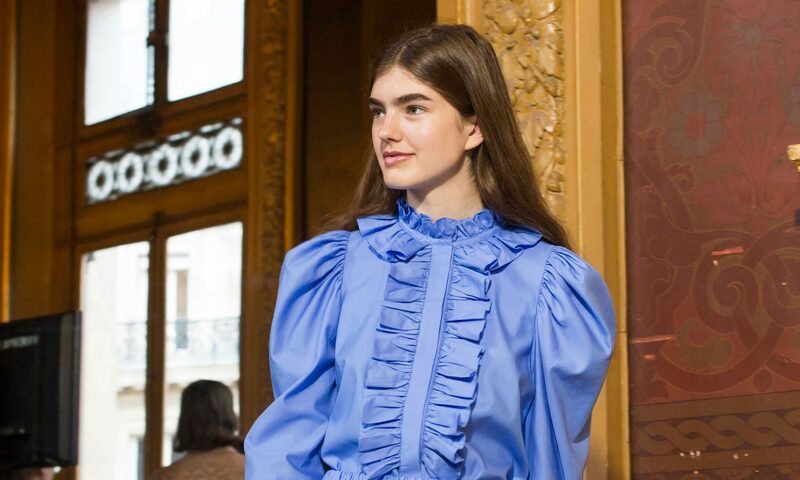 The contrast between a buttoned-up look and a bit of feminine frill is the kind of tension that makes for outfit magic. These pieces inject a bit of unexpected fun while still looking polished. Product Credits: 1) TED BAKER Bubbl Ruffle Detail Peplum Top. 2) STELLA MCCARTNEY Kaley Black Trousers. 3) H&M Viscose Jumpsuit. 4) STELLA MCCARTNEY Shaylee Poplin Shirt. 5) MAGGIE MARILYN I Lead From The Heart Striped Cotton-canvas Blazer, available at Neiman Marcus.